Okay….before you jump into any conclusion..let me confess that this is not one of my best shots. One glance and you might think…why did she put this up. Let me tell you why. I think this photo is totally funny. We were visiting a temple when I saw this tractor fully loaded with hay. SO loaded…that you couldn’t see if there was any vehicle behind the it. Even a poor man riding a bicycle had to get off the road. The driver had stopped in the village and was wandering when a cow came along. The poor thing was soo hungry that it started chewing on some of the hay loaded onto the tractor. You can observe the cow to the right hand corner of the picture. This entry was posted on July 30, 2008 by IdliDosa. It was filed under Uncategorized and was tagged with Animals, camera, color, color photography, colour photography, digital camera, hay, india, photo blog, photo blogging, photography, photos, pictures, wordpress photo blog. Wow, that’s one huge bale of hay! I wasn’t wondering why. I’m thinking this is hilarious and OMG huge! It looks like he’s towing a Mammoth from the dark ages. Goodness sakes! Just goes to show that even photos that are not “perfect” are still incredibly worthy. They tell the story of life. Thank you for posting. Hey Ramya, nice pic! I am wondering how they put the whole big thing on to the tractor! 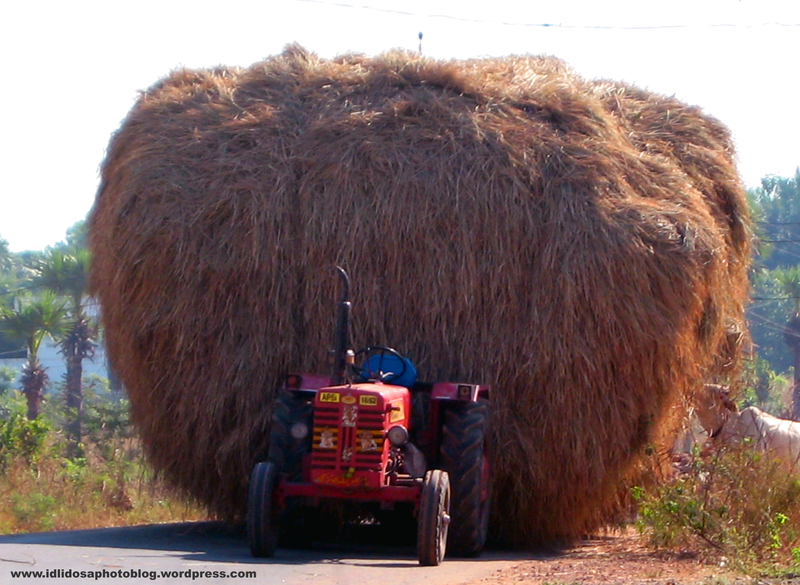 Though it is hay and doesnt weigh much, I dont think it is easy to lift such a big bunch! no???!! !